Sew what's cooking with Joan! : Some like it HOT! 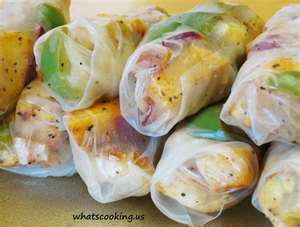 Jerk Chicken Spring rolls! In the Caribbean most people like their food with a kick- that means HOT and flavorful spices. Jerk and hot sauces have helped to define the cuisine of the region, however, peppery hot foods have been a part of the human diet for thousands of years. Long before the ancient Greeks and Romans gave monetary value to peppercorns (they were used to pay fines, rent and taxes and to buy and free slaves), the South American Indians were eating fiery hot wild chiles. Chiles were eaten in Mexico, Brazil and Peru 6,000 years before the birth of Christ and were one of the first domesticated plants in the New World. Peppers, hot and sweet, pack a wallop of vitamin C, and are a good source for vitamin A and potassium. SIMMER DOWN: Sprinkle fresh lime or lemon juice on hot, spicy food to simmer it down. STAY COOL: I always use disposable rubber gloves when handling peppers. 2)Cook chicken on a grill(7-8 minutes) or in the oven (8-10 minutes at 350 F) Once chicken is cooked, allow to rest before cutting it into thin strips, then set aside. 3)In a large bowl, add 2 cups of luke warm water, 3 ounces rice wine vinegar and a pinch of sugar. Place rice paper inside the warm water removing when soft. Lay the wet rice paper on a damp towel, wiping away any excess water. 4)Lay a single sheet of damp rice paper flat. In center, place a few leaves of greens, two or three mint leaves, shredded carrots, green onions, and the strips of jerk chicken. Flap one side of the rice paper over and roll. Saute diced fresh mango with a pinch of salt in a sauce pan thinly coated in oil. Cook on low heat for 8-10 minutes. Puree mango in a blender then pass through a strainer before adding finely chopped scotch bonnet pepper/substitute chili flakes and julienne mint. I took classes in Seattle at Uwajimaya, in the 1980's, learned to make spring Rolls and other Asian influenced dishes. But, in recent years, my children are the ones that opened up my eyes to Spring Rolls! Enjoy! Love your recipes! Can't wait for the quilting to begin!! I will get started on quilting when I get back to my Mom Cave!! (sewing room) I will most likely intertwine with recipes and tips. 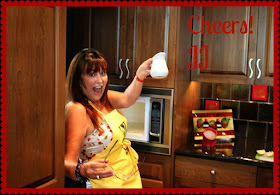 Are you the Joan that was in the original Yankee Kitchen Certificate courses in Bellevue? We went for years, until they moved to a new location, and changed the name to Mr. J's. Then we studied with Eva Kenly, for about 15 more years. I think you went through two pregnancy's during our schooling. Your face looks the same. Great tips for handling peppers! Thanks! Yes! That would be me!! Eva Kenly recall's me Hugely pregnant with my youngest daughter, and couldn't believe I would stand in the Yankee Kitchen, making that night's recipes!! Hahaha good times, good memories! I will be posting my full profile with all my teacher's names, when I get back to my home. But, includes Julia Child, Betsy Oppenneer, Martha Stewart, Nancy Lazara and many more. One thing I forgot to mention. Do not rub your eyes until you have washed your hands thoroughly. Lemon juice helps in the washing process as well!! I was sent a question privately and wanted to answer on the blog. If you have a sensitive tummy, use a less hot pepper. The bigger peppers of which ever variety are milder. See above. Scotch Bonnet's are HOT! So choose a milder one.